Yet more than 600 vessels have entered Crimean ports in the past two years, and OCCRP research indicates both Western and Middle Eastern businessmen continue to trade with Crimea, in violation of the policies of their own countries. What makes it easier for them is that to date, Ukraine has not prosecuted a single vessel owner or captain. In early December of 2015, a vessel named General flew the blue-and-yellow flag of the Republic of Palau as it passed through the Bosphorus, the channel linking the Sea of Marmara to the Black Sea at Istanbul. The ship was heading towards Ukraine, its official route stated as: Nemrut Bay (near the Turkish city of Izmir on the Aegean Sea) to Kherson, a Black Sea port city on the southern Ukraine mainland northwest of Crimea. However, on Dec. 4 the vessel lay near the entrance to Sevastopol harbor in southwest Crimea, the peninsula’s largest city and home to the Russian Navy’s Black Sea Fleet. The General disappeared from international tracking radar for 10 days. On Dec. 14, its onboard navigator was turned back on, and General returned to the Turkish port. It apparently never went to Kherson. According to international navigation standards, every international vessel must carry an electronic “navigator” linking it to the Automatic Identification System (AIS), a global network that tracks vessels using satellites, reports from passing ships and radar. It is possible to follow the movement of vessels throughout the world via AIS navigators, using the website http://www.marinetraffic.com/. Reporters for OCCRP did just that for almost a year, following vessels around Crimea including tracking the disappearance of the General. Experts say the ship must have turned its AIS navigator off, which is only possible if the power on board is cut off. From Dec. 9 to Dec. 11, at the request of OCCRP journalists, Sevastopol residents took a series of photos showing the General loading scrap metal in Sevastopol’s harbor at Inkerman Pier. The photos demonstrate that, in defiance of international prohibitions, the General spent at least five days in the port of Sevastopol loading goods. Who authorized the load of scrap metal—or the visit to Sevastopol—could not be determined. Reporters for OCCRP did establish that the General is owned by a Lebanese company, New Marine Co. There is no information on this company available in Lebanese open registries. Attempts to contact the company were unsuccessful. The General, photographed at the dock in Sevastopol. On June 16, 2014, several months after Russia annexed the Crimea, Ukraine closed the peninsula to international navigation. Subsequently the EU and US also banned entrance into Crimean ports and imposed corresponding sanctions. Despite this, hundreds of vessels flying flags of various countries continue to visit the peninsula. Information on these vessels is being gathered by both governmental and non-governmental institutions. According to data collected by the State Hydrographic Service of Ukraine, the Ministry of Infrastructure of Ukraine, and the non-governmental organization “Maidan of Foreign Affairs,” as of June 2016, 602 vessels have entered Crimean ports. Most of them are registered in Russia or fly Russian flags or are Ukrainian registered ships seized and operated by Russia. However, Europeans are also doing business with Crimea despite the sanctions: over the past two years, 24 vessels bearing EU countries’ flags, 43 vessels registered in the EU and 22 vessels owned by EU beneficiaries have entered Crimea. The vessel MS Südkap, owned by the German company Krey Schiffahrts GmbH, was in the eastern Crimean port city of Kerch in late July of 2014. Reporters for OCCRP first sent a letter with questions to the German company; next, an OCCRP journalist called its office and talked to its chief executive officer, Daniel Grensemann. The only thing he said was that his company had experienced huge problems because its vessel had entered Crimea. However, he did not answer the letter. Krey Schiffahrts inspector, captain Maxim Babenko tried to explain over the phone, how the German company generally operated: “Our vessels are contracted by third parties that find cargoes and transport them. I mean, we do the transportation, but they find the cargoes. The Embassy of Germany in Ukraine promised to alert relevant authorities in Germany regarding a possible prosecution. “[The] Government of Germany and its partners in the EU have more than once proved (their) determined condemnation of the illegal annexation of Crimea and Sevastopol by the Russian Federation, and will not recognize it. This position remains unchanged,” a written statement from the embassy said. The reaction of other European embassies to the violations was muted, or, in some cases, non-existent. For instance, the Embassy of Greece did not respond to questions about a large tanker, the Kriti, that arrived in Kerch in June 2014. Although at that time Ukraine had not yet officially closed the Crimean commercial ports, the General Assembly of the United Nations had already published a resolution stating that countries including Greece supported Ukraine’s territorial integrity. The Kriti is part of the fleet believed to be owned by the wealthy Vardinoyannis family of Greece. 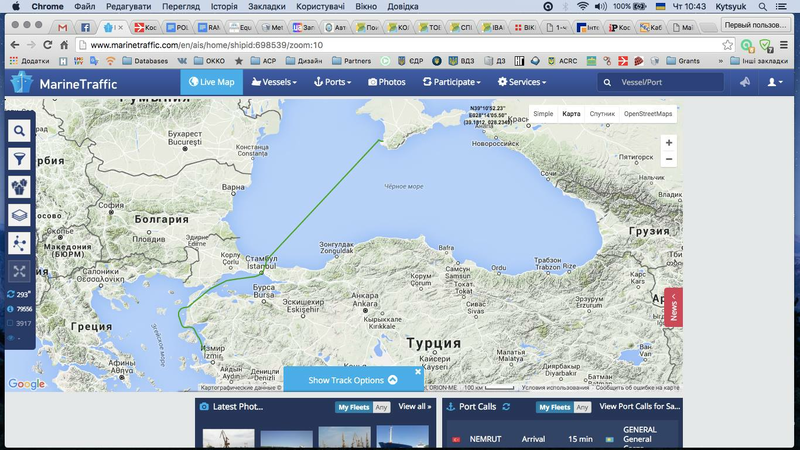 Neither the Embassy of Greece in Ukraine, nor the company owning the vessel, would say what it was doing in Crimea. In October of 2015, another ship arrived in Crimea to pick up a cargo of scrap metal, also from Sevastopol. The vessel was named Ramzi and it flew the Togolese flag. This ship is owned by a Romanian company, JSM Maritime Ltd., which in turn is owned by the family of Syrian businessman Johar Hasan. From Crimea, the Ramzi headed to the Lebanese ports of Beirut, Tripoli, and Jieh. The Embassy of Romania in Ukraine did not consider the Ramzi a Romanian responsibility, noting that Romania only controls ships that fly the Romanian flag. A ship may be owned by a company from one country, and navigate under the flag of another; or, a ship found in violation of some law can easily switch its flag to a different country with different laws. Ali Aliyev, former employee of Turkey’s Palmali Group of Companies, says Palmali changes flags when its ships head to the Kerch Strait, which connects the Sea of Azov to the Black Sea, separating Crimea from Russia. “Back in the day, when passing the Kerch Strait, we used to raise the Ukrainian flag, and now we raise the flag of Russia,” he said but denied the ships are visiting Crimean ports. The Palmali Group is one of the best-known logistics companies in Turkey. Palmali’s fleet has more than 100 vessels. Among its largest clients are Russia’s Lukoil and Azerbaijan’s SOCAR. In late 2015, international media reported that Maltese authorities were looking into Palmali’s involvement in oil trade with the Islamic State (IS). During the past two years, records show six Palmali vessels arrived in Crimea. He did not respond to OCCRP’s request for comment. When OCCRP journalists visited the company’s office in Istanbul, they were not allowed to film the office or environs and were told to contact the media department. The latter did not respond over the course of several months. Currently, Ukrainian police are investigating four criminal cases involving illegal entry into occupied Crimea during the past two years. In the port of Kherson, there is an arrested Turkish vessel, the Kanton: in 2014, it arrived in Crimea, and in March 2015 it arrived in Kherson, where it was detained. Ilya Ryzhkov, acting head of the administration of Kherson sea port. Ilya Ryzhkov, acting head of the administration of Kherson sea port complains that no court decision has been issued. “The captain and the crew have left the vessel,” Ryzhkov said. The prosecutor’s office is investigating three other illegal entry cases. Four persons have been declared suspects and put on the wanted list. According to the Criminal Code of Ukraine, only the captain and members of the crew of the violating vessel can be prosecuted. If convicted, they can face up to 5 years in prison, but there is no legal way to pursue the company operating the vessel, or its owner. The Ministry of Infrastructure is building dossiers on the vessels that have visited Crimea since the ports were closed, passing this information to the prosecutor’s office and the Ministry of Foreign Affairs. Klimkin said he was familiar with the ships and countries that OCCRP has investigated and noted that the number of violations has decreased lately.